The year was 1981. Disco was fading while punk was morphing into post punk and new wave. The 80s hair metal scene was just beginning to take root, but three guys from Long Island, NY, had different ideas for what their new music should sound like. Instead of looking forward, they looked to the past, specifically the rockabilly music of the 1950s. 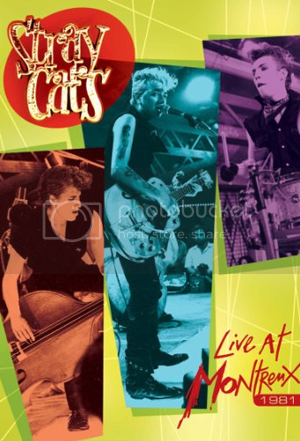 Formed in 1980, they called themselves the Stray Cats and none of its three members (Guitarist/vocalist Brian Setzer was the oldest at age 22) were even born when rockabilly was in its heyday, yet here they were with simple drums, an upright bass and a Gretsch guitar playing a revved up new music that was completely rooted in the past. The problem was, America wasn’t ready for their sound quite just yet, so they took it across the pond to more appreciative audiences in England, releasing their debut album in 1981. That album, along with their second release, was cherry picked to select tracks for their American debut, Built For Speed, but that was still to come. On July 10, 1981, the band played the prestigious Montreux Jazz festival. Thankfully for fans, the cameras were rolling and their exciting performance is now available as Stray Cats – Live At Montreux 1981. The show, which is roughly half originals and half cover versions, opens with the up-tempo “Sweet Love On My Mind.” The track, which was originally done by Johnny Burnette’s Rock ‘n’ Roll trio, begins with a raucous drum and upright bass intro, courtesy of Slim Jim Phantom and Lee Rocker respectively, before Setzer joins in the fray. Setzer’s playing is restrained during the verses, but he really cuts loose during the solo, showing a high level of ability and a deep love of the genre. The band follows that up with another barnburner, Gene Vincent’s “Double Talking Baby.” From the outset, the normally reserved Montreux crowd is into it, dancing in the aisles. The first original track in the show is “Rumble In Brighton,” a dark, minor key rocker. Its lyrics about gang fights match the intensity of the music while Setzer delivers some of his best playing. Of course, no Stray Cats show would be complete without two of their best-loved tracks, “Stray Cat Strut” and ‘Rock This Town.” The former is an inspired performance filled with attitude that eclipses the studio recording while the latter is like the song on steroids, so fast-paced is the riffing. The show closes with another Vincent number, “Pretty Pretty Baby,” one of two songs in this performance never previously released on a Stray Cats album. Drenched in sweat, the band musters up the energy to deliver one more strong performance with great lead playing from Setzer. The Stray Cats still perform on occasion and still deliver the goods. Setzer, Rocker and Phantom have kept the rockabilly flame burning for more than three decades now are rarely has it shined brighter than it does on Stray Cats – Live At Montreux 1981.